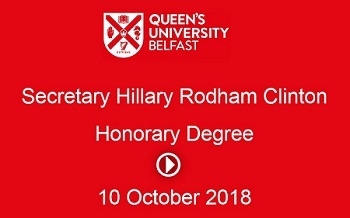 Former US Secretary Hillary Rodham Clinton has been awarded an Honorary Degree of Doctor of Laws by Queen's (10th October) for her ‘exceptional public service in the US and globally’, and for her ‘outstanding contribution to peace and reconciliation in Northern Ireland’. Speaking ahead of the ceremony, the President and Vice-Chancellor of Queen's, Professor Ian Greer said: "We are delighted to award an honorary degree to Hillary Rodham Clinton. The former US Secretary of State is an internationally-recognised public servant, who has developed strong links with Queen's and Northern Ireland. "She made a considerable contribution to the Northern Ireland peace process and, as Secretary of State, focused on economic development to underpin the emergence of a strong and competitive Northern Ireland. “With her long-standing commitment to peace, stability and economic regeneration, she is a strong advocate for Northern Ireland and an inspirational role model for the Queen's community." Reflecting on her career in public service, Professor Scullion highlighted Secretary Clinton’s campaigning for the empowerment of women and her work on children, disability rights and other social reforms, and acknowledged her efforts to improve educational standards and access to healthcare. And she underlined Secretary Clinton’s contribution to Northern Ireland over 30 years and her endeavours to encourage respect between people. Addressing the audience of staff and students from the University, talking about the political situation in Northern Ireland; the peace process and Good Friday Agreement; Brexit and democracy Secretary Clinton said: "The world is watching, Northern Ireland has been a symbol to people...of democracy," she said. "We need that, that symbol, that reality, more than ever because democracies across the world are facing a toxic backlash." "We are at a point in our history, not just in Northern Ireland, but in the UK and Europe and across the world where we are facing real difficulties in how we want to move forward. It poses very real questions, not just for politicians but also for citizens." On the UK’s withdrawal from the EU, she said: “I make no excuse for being against Brexit from the start. I thought it was a bad idea before the referendum and I think it’s an even worse idea now. Secretary Clinton also spoke about her first visit to Northern Ireland in 1995 as the then First Lady with President Bill Clinton and how different a place it was back then, and how much it has progressed. "It was such a great pleasure for me to return to Belfast. It is such a special place for me and my family and we are delighted to be back here." Earlier during the honorary degree ceremony Professor Scullion also announced a new scholarship and fellowship in Secretary Clinton's name, honouring her long-standing commitment to peace, stability and education. The Hillary Rodham Clinton Award for Peace and Reconciliation Scholarship will give two exceptional female students from the US who wish to pursue study in a field related to politics, conflict transformation or human rights, the opportunity to study at the University. The Hillary Rodham Clinton Early Career Fellowship will allow an outstanding early career researcher to work in the fields of conflict transformation; global security and borders; human rights including women’s rights and children’s rights; international law; international politics; international relations; and women in politics. To watch the entire honorary degree ceremony, click above or here. For media enquiries, please contact Queen’s University Communications Office, tel: +44 (0)28 9097 5845.